Harleysville Health Insurance is considered to be one of the leaders in property and casualty insurance. The company insures individuals and businesses in 32 states in the Eastern and Midwestern United States. The company, which has been in existence since 1917, specializes in insuring property, casualty, and life insurance products. You can find an independent agent in your area on the Harleysville website. Simply input your city, state, and zip code. Once this is complete, a list of agents in your area will appear with their name, address, phone and fax numbers, email address, and website. The website also provides an alternative way to find an agent. The site provides a map of the United States with all the states highlighted where there are agents. By using this tool, the agent’s information, including address, phone and fax numbers, and email address, will appear. Directions to the agent’s office will also be listed for your convenience. According to the Harleysville site, they do not offer health insurance. The closest insurance to health insurance through Harleysville is their workmen’s compensation program. Through their workmen’s compensation program, you can view providers within the network that the employer established through Harleysville. Policyholders can also go view eligible providers online. Harleysville claims can be reported by either calling 800-892-8877 or submit the claim online via the website. To file the claim online, simply fill out the requested information and hit “submit.” Once the claim form is received, a claims representative will contact the policyholder. Harleysville also provides access to view the status of your claim that was already filed. Each claim is given a letter and or a number. The website breaks down the claims by letters and numbers; so in order to check on your claim, you must click on the letter or number that your claim starts with to begin the process of viewing the claim status. Insurance fraud costs individuals and businesses money every year. Harleysville provides an anonymous way for people to report fraud. Simply fill out the online form with the information and submit. 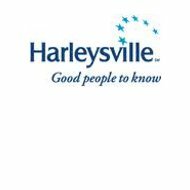 Harleysville careers can be viewed on the company’s website. Interested employees can view job openings and the location in which the job is open. If you are interested in any of the positions, you can click on the job openings to view descriptions, qualifications, and apply online. You can contact Harleysville customer service either by dialing 800-338-8301 or by emailing the company. Harleysville Insurance Company maintains an “A” rating by A.M. Best. Compare health insurance companies and receive quotes from other “A” rated providers by typing your zip code into the free rates tool now!